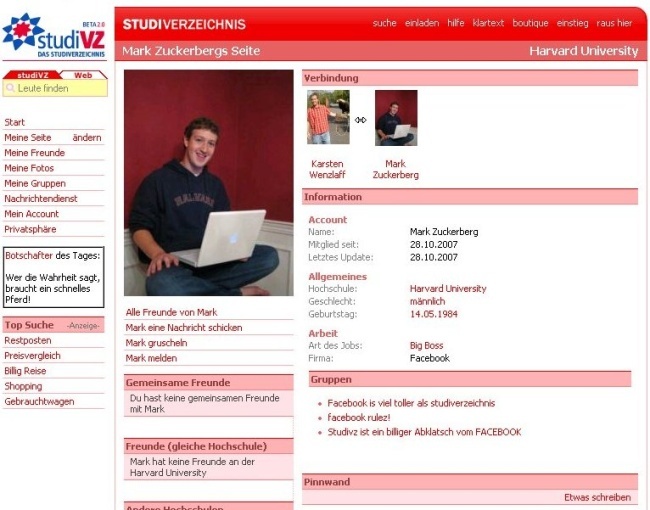 Facebook is starting to pursue social networks that have copied their design or features by suing German site StudiVZ. The Financial Times has reported that Facebook filed a suit in California against the German company for what it claims is an infringement of Facebook’s “look, feel, features and services”. StudiVZ claims to have 10 million active members, and is the largest social network in the German-speaking world, covering Germany, Belgium, Austria and Switzerland. The network is actually comprised of three different sites, each one a separate social network aimed at different segments of the market. StudiVZ .net is the classic site for college-aged students, SchuelerVZ.net is for high school students and MeinVZ.net is for older adults (these three networks were very hard to decipher in German when I attempted to sign up). Facebook does seem to have a claim here, as the German site looks like nothing more than Facebook in red and translated in German. Everything from the first public page to the sign-up page and the profile pages look eerily similar to the US-based social network. StudiVZ was acquired earlier this year by the German media group Georg von Holtzbrinck, with an acquisition price in the €100M range. They always say you should sue where the money is, and Facebook has certainly found a pile of it by targeting Verlagsgruppe Georg von Holtzbrinck.